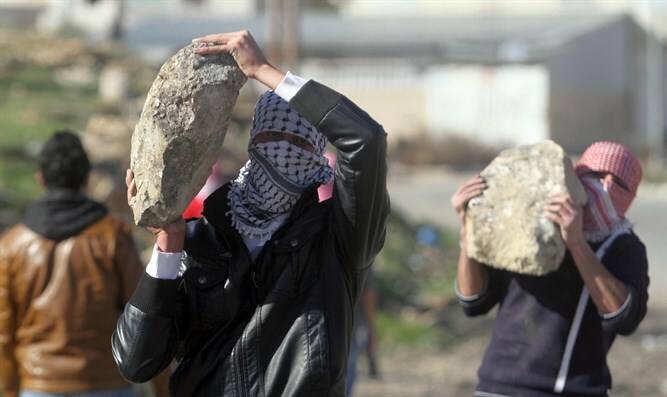 IDF forces arrest 24 for rock throwing, rioting, in weekend crackdown. Over the weekend, IDF forces arrested 24 suspects who are suspected of being involved in terrorism and participating in riots targeting both IDF soldiers and civilians. A Company from Battalion 636 nabbed three rock throwers near the town of Hermala after they were spotted hurling stones at Jewish cars traveling in the Gush Etzion region. A joint IDF-Israel Police operation in Hevron, Yatta, and Al Omri also turned up three firearms. The IDF also said that, during another weekend operation near the Samarian village of Itamar, IDF soldiers were confronted by 'Hilltop Youth' who attempted to establish a new outpost. Soldiers were forced to shoot in the air and use riot dispersal devices to defuse the situation, something the IDF said it viewed with "the utmost gravity". All all the suspects were arrested by police. "The IDF views with great severity the use of violence against its forces and will continue to enforce law and order in conjunction with the rest of the security forces," said an IDF spokesman. In a separate mission over the weekend, an unknown assailant opened fire at an IDF position near the village of Mevo Dotan. There were no reported injuries.